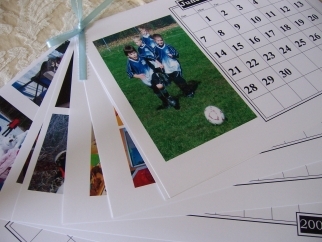 Making a homemade calendar using Microsoft Word Calendar Wizard is so easy, and can be a great Father’s Day gift from the kids. With a computer or laptop, a color printer, some sturdy printing paper, and selected digital pictures, an affordable and creative gift is only a few minutes away. And dad will absolutely love going through the memories of his kids on display each month. Open up Microsoft Word and choose File|New. Choose the Other Documents Tab and select the Calendar Wizard. Follow the steps outlined in the wizard to create the calendar. You may want to start with June and end with next May to make a “Dad Year Calendar”. Have the kids select their favorite pictures from your family’s collection. Identify which pictures will be used for each month. One idea: keep the theme of the month in mind when choosing photos, for example, choose birthda pcitures of the kids on their birthday months, summer vacation pictures for summer months, etc. Replace the picture icon on each month page on the Calendar project with the digital pictures the kids have selected. Punch a hole in the upper left corner of each page and tie together with decorative ribbon. Protect the calendar by placing it in a large white envelope. The kids can decorate the envelope with pictures, glitter, and stickers, and write a nice Father’s Day message on the outside.